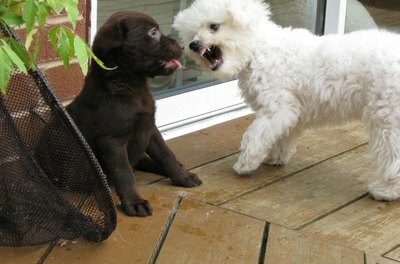 Play fights are crucial to canine socialization. Puppies learn from their mother and from each other. They establish pack hierarchy by play fighting. They will attempt to assert dominance over each other until the natural order of the pack is arranged. If the fighting is regular or becomes too rough, you should step in and train the pups not to fight. Put the dogs together. Once your pups are weaned, only let them socialize under your supervision. If they are still young enough to feed from mom, she’ll take care of any bad behavior herself. Observe the puppies at play. Watch how they interact and pay close attention to which dog is dominant and which one is passive. There is always a pack order and dogs are happiest when this order is clearly established, even if they happen to be the submissive dog. The passive dog will typically display this with submissive gestures, such as rolling over, averting his gaze, moving out the other dog’s way and patiently waiting his turn to feed. Note down the gestures that precede fighting. These typically include growling, sustained eye contact, flashing teeth and holding the tail still. By learning to recognize these gestures, you can diffuse a fight as soon as it begins. Note down the stimuli that provoke fighting between your puppies. Dogs are generally good at maintaining their own societal structure and they are instinctively averse to risking injury by fighting unless survival, food or the opportunity to mate are at stake. Fights typically break out when a change to their immediate environment confuses pack order. For example, if you give a toy to the passive pup, the dominant pup may become rough with him to assert superiority. This can cause a fight. Similarly, feeding pups too close to each other, or fussing one before the other can cause friction that leads to a fight. 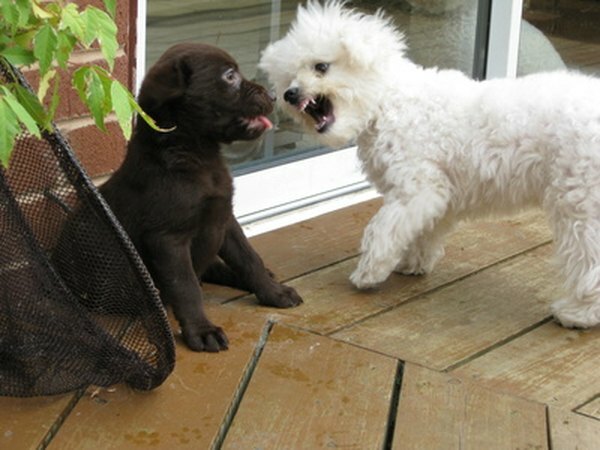 Distract the puppies if they begin to fight at the next playtime by calling their names, making noise or both. Clap your hands, stamp your feet or blow a whistle. Never physically break up a fight unless you feel there is a risk of injury. This is very rare, especially with puppies who are too small to inflict any real damage on each other. Reward the puppies as soon they turn their attention to you. Do this by giving the dogs a food treat or toy. Dish out rewards in order of pack superiority. Ignore the dogs. Once you stop paying attention, they’ll begin to interact again. Repeat the distraction technique then give a reward. This teaches the dogs that abstaining from fighting has a positive outcome. Your pups will learn that positive stimuli arrive when they don’t fight, so they’ll behave accordingly. Over time, you can gradually phase out the reward part of the training and just use the distraction technique. Healthy Pets: Do Your Dogs Have a Serious Case of ‘Sibling Rivalry’? What Causes Dogs to Fight During Meals?